I loved learning how to drive, he made me feel really comfortable and was very patient, if ever I made mistakes, he would explain what I did wrong and help´t me try again until I got the hang of it. I was never a confident driver, but he praised me and made me feel more confident. 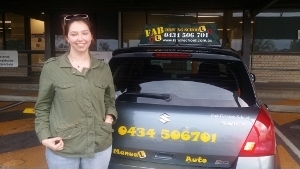 I will recommend Fab to everyone looking for driving lessons Great instructor excellent driving school.